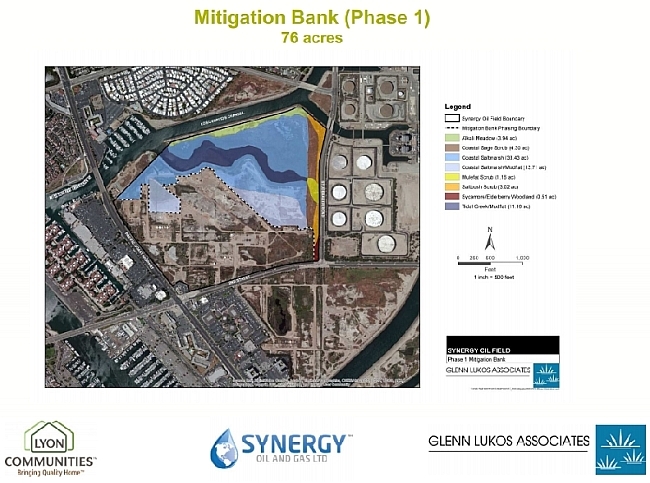 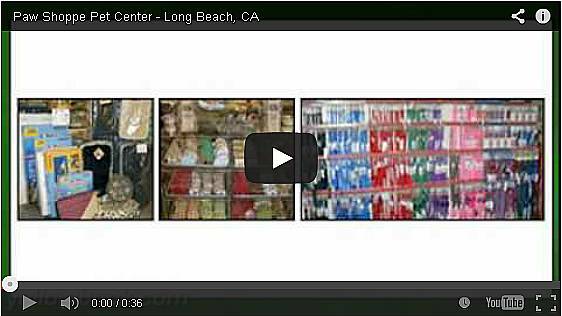 (Feb. 2, 2015) -- LBREPORT.com provides extended VIDEO coverage below of the public meeting organized by the Los Cerritos Wetlands Land Trust at which John McKeown, CEO of Synergy Oil & Gas, and Thienan Pfeiffer of Glenn Lukos Associates described, and fielded Q & A on, an ambitious company plan they say could remove decades of accumulated above-ground oil eyesores and restore large portions of the roughly 165 acre Los Cerritos Wetlands north of 2nd St. between Studebaker Rd. 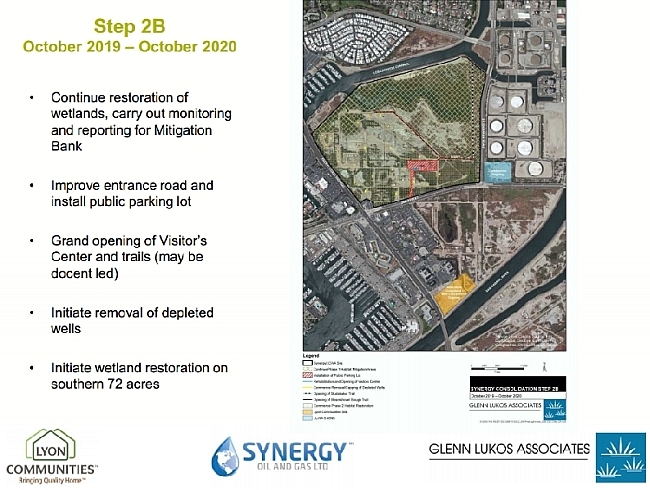 and PCH. 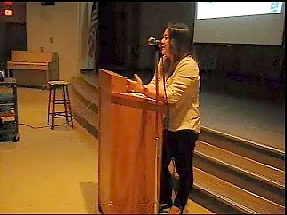 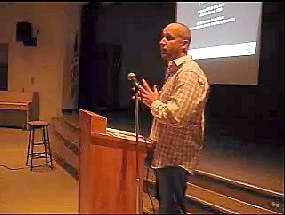 Roughly 130 people attended the Jan. 27 event at the Kettering Elementary School auditorium where company reps described plans to restore the Los Cerritos wetlands' natural (now degraded) habitats and enable public access (via trails, possibly with docents) while simultaneously operating the company's valuable oil field below the surface from the "pumpkin patch" (southerly along PCH south of 2nd St.). 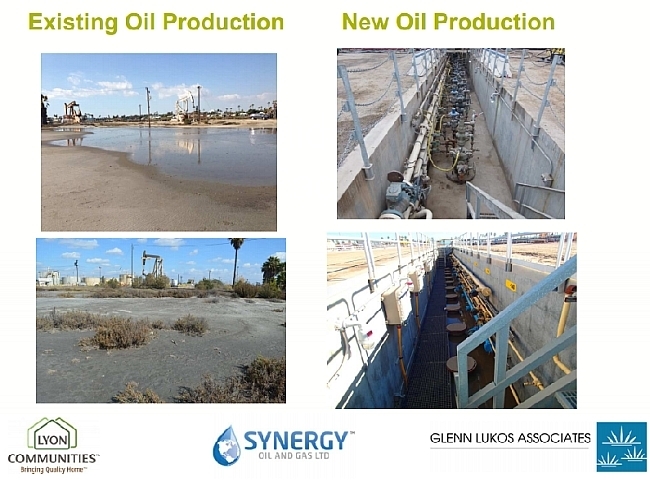 Dressed casually, Synergy CEO McKeown explained how he became involved with the project and the evolution of his thinking on how to address modernizing the oil field operations and also produce a restored wetlands. 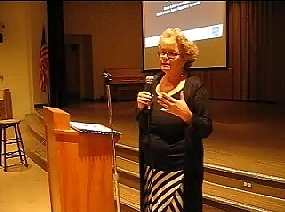 Ms. Pfeiffer joined in explaining the proposal's phased elements using Power Point slides. 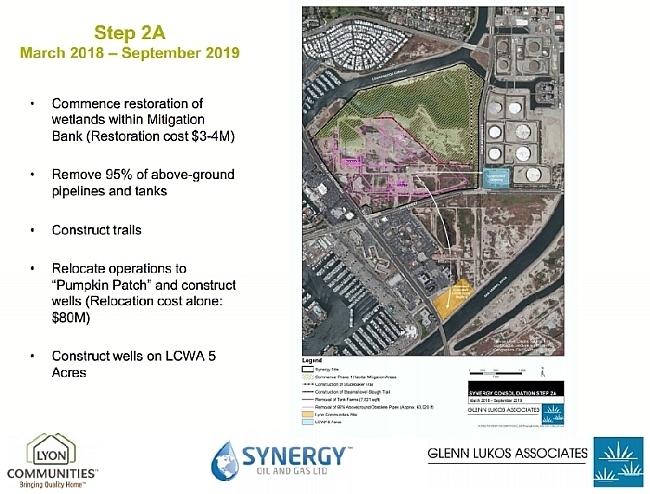 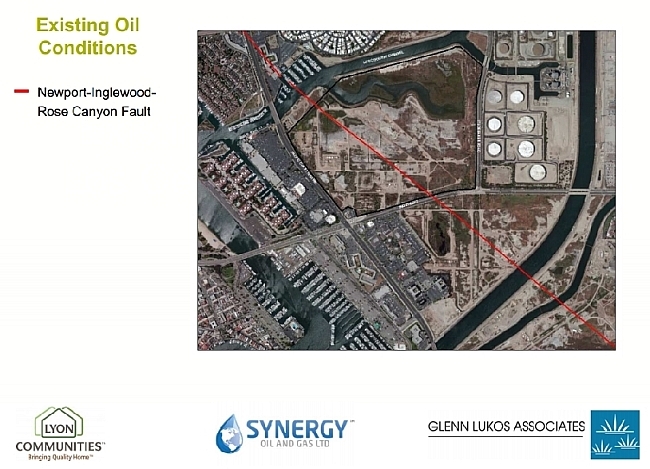 CEO McKeown said the red line shown on the slide photo below is the Newport-Inglewood fault...and noted that photos of the Long Beach-Signal Hill area decades ago show oil drilling operations running along the fault line. 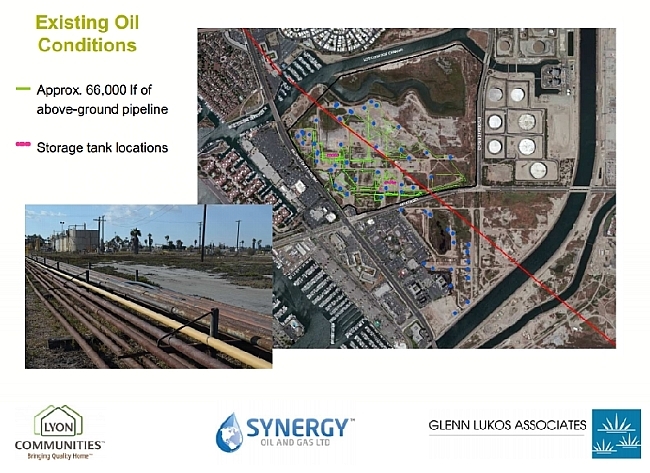 Mr. McKeown said only a small fraction of the pipelines visible on the property are currently being used. 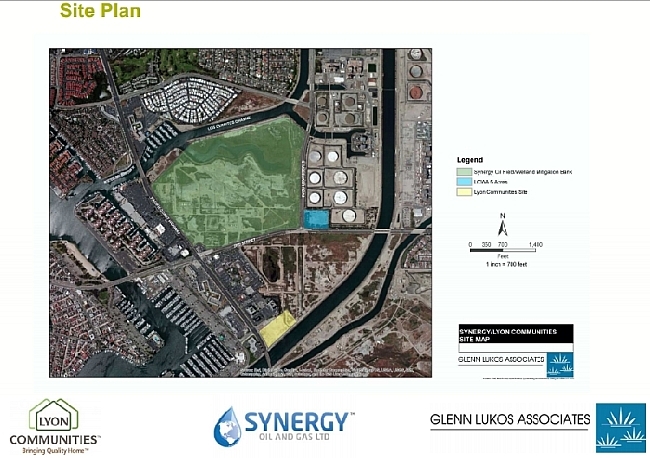 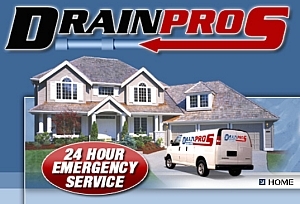 In the photo below (lower left), he said the yellow pipeline is in use, but the others aren't. 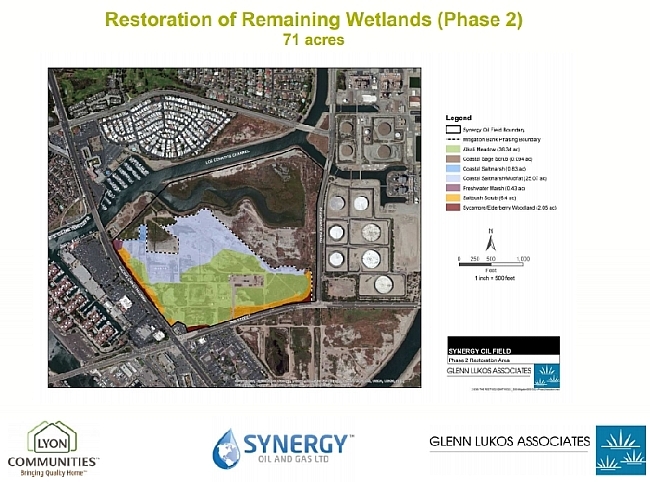 Los Cerritos Wetlands Land Trust Executive Director Elizabeth Lambe has called the proposal intriguing and, while not taking a position on the proposal at this point, said she strongly favors its discussion by the public. 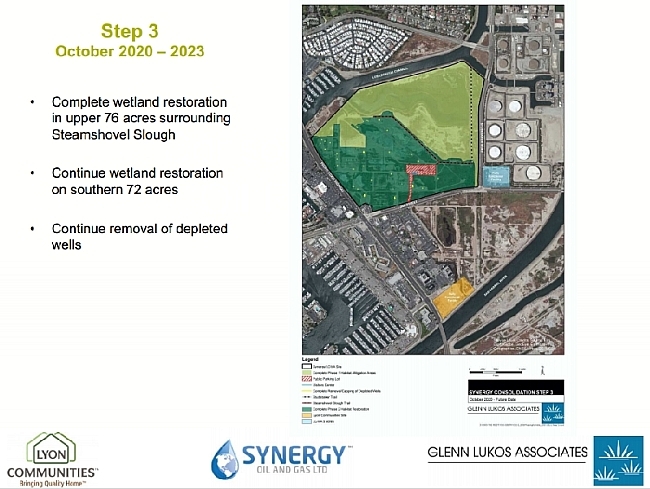 Ms. Lambe suggested that other community groups might also wish to invite Synergy to present its plan at their group's meetings.